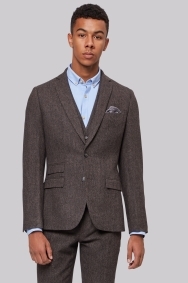 This unique jacket is a sophisticated alternative to your standard grey or black suit. Subtle brown and grey hues create a vintage look, while the wool blend adds a sense of comfort for all-day wear. With its skinny fit, it has a modern edge and sleek silhouette. It looks great whether smartly fastened or undone for a more relaxed look. 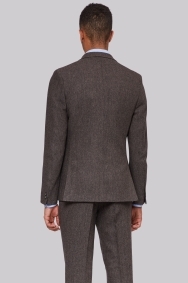 Asymmetric pockets and narrow notch lapels add subtle details to the jacket. Complete the outfit with the matching waistcoat and trousers, and select a pastel blue or pink shirt to complement the brown shade. Excellent price, excellent fit, love it. High quality, good fit, excellent value. Love it. Fit me well and looks really good on me. Thanks! Absolutely love my new tuxedo. Fits perfectly. Fabulous! Lovely details, subtle lining, and a well-formed half-canvas construction which adds to the shape and drape of the fabric. 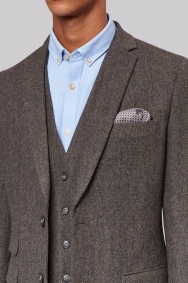 An ideal autumnwear suit!